Is Maybelline Kidding With This? As I wrote in a previous review, I pretty much grew up using Maybelline’s “Ultra Lash” in a simple white tube (occasionally “borrowing” my mother’s Estee Lauder tube, something never to do with mascara because of the possibility of germ contamination and eye diseases). I’m sorry it’s gone now, as it worked well. I could build as much coverage as I wanted and still appear natural....read more When I grew older, I tried their “Great Lash” (not truly a great product, but still good). And then my experimentation grew to include nearly every drugstore and department store brand possible. Like many women, I was looking for “THE” mascara which would make my lashes much like Scarlett O’Hara’s elongated, curly, full black ones, the ones she would simply bat and have men falling at her feet. 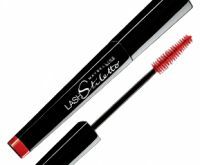 When Maybelline New York's "Lash Stiletto Ultimate Length Washable Mascara" appeared on the shelves (approximately $8.50), I was reviewing items for another popular online beauty site. The marketing campaign was orchestrated brilliantly. Commercials kept flashing seductive, mile-high shoes and flashy black patent. A sultry voiced announced the benefits; I was convinced—this was IT! It was my understanding from ads that “Stiletto” would take my lashes to the sky, give them a glossy finish, and separate them perfectly. Talk about deception in advertising! “Stiletto” was one of my greatest disappointments. It did nothing—absolutely nothing—in terms of adding any length (or volume). There was no gloss. It had been misnamed; it should have been termed Maybelline’s “Slip-On Shoes” Mascara. Or perhaps “Maybelline’s Flip-Flops” (emphasis on “FLOP” here). What in the world did it have in common with stiletto heels? It tinted my lashes, but the brush wasn’t particularly useful and I had some problems with clumping. I have to mention this. There was a distinct ugly odor, very hard to describe, which emanated from the product as I used it and remained when I finished. Perhaps I had bought a tube from a bad lot; I got a refund and purchased it elsewhere. The stench remained with my new tube. And there were still no spikes for me. The next move? At least it was washable. I removed it and threw the tube in the trash can, where it belonged. I liked how shiny and dark the formula was, and the brush was fine, but this BURNED my eyes like crazy. I will NEVER use this again. I like that this makes my lashes ultra black, but it flakes off pretty easily. I wouldn't say that this defines and lengthens the appearance of my lashes. It's just a general mascara like anything else.